Modern research into the reintroduction of wolves sheds positive light on the animal's influence in its environment. As the ecosystem's top predator, a wolf's influence is far-reaching and improves the quality of life for plants and animals alike. Wildlife experts are out to prove that the benefits of reintroducing wolves far outweigh the disadvantages. In the absence of wolves, coyotes take over the top tier of the food chain, according to the Jackson Hole Alliance. Smaller than wolves and unable to bring down large game such as elk or moose, coyotes feed on the smaller pronghorn antelope, preying particularly upon the fawns. Without wolves, moose and elk have few natural predators and will overgraze the surrounding area. When wolves are present, coyotes take their place as mid-level predators. Herds of pronghorns thrive as wolves are reintroduced. Wolves may kill coyotes, and will drive them away from a kill site. Wolves help maintain healthy populations of elk and moose by culling weak or sick members from the herd, according to the Wildlife Management Institute. Studies performed by Yellowstone National Park showed that elk brought down by wolves were old, and many suffered from arthritis or disease. When wolves remove such animals from a herd, there may be more food for younger, fertile elk. Wolves also may help reduce the number of deer and elk suffering from chronic wasting disease. A wolf's kill can feed many mouths. 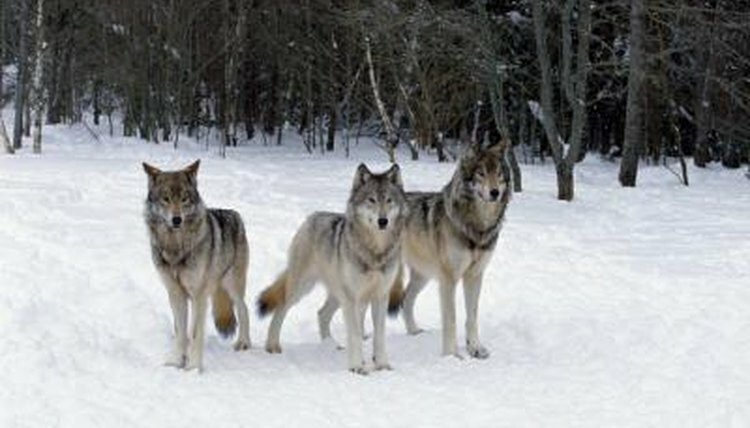 A single wolf pack may eat 20 pounds of meat in one sitting, according to National Geographic, but that leaves a hefty portion to waste if not for the scavengers fortunate enough to follow in the wolves footsteps. Coyotes, magpies, golden eagles and ravens are among the scavengers known to feast upon leftovers. Maintaining a strong scavenger population depends on a steady supply of protein, which wolves can provide. The wolf's influence has a far-reaching effect on their environment. When wolves are present, elk remain alert and will not over-browse the vegetation. This enables new trees to take root, according to the Jackson Hole Alliance. Aspen groves, which house songbirds and beavers, are able to grow. Beavers improve water quality by building dams that trap sediment and create wetland environments. The beaver's work enables the water to cool, ensuring a healthy fish population. The Wolves and Humans Foundation: Why Reintroduce Wolves?